ReTooled: Highlights from the Hechinger Collection, an engaging and thought-provoking look at the unexpected subject of tools, will be on view at the Bruce Museum in Greenwich, CT, from September 22 through December 30, 2018. Featuring more than 40 richly imaginative, quirky, and thought-provoking paintings, sculptures, photographs, and sketches, ReTooled celebrates the prevalence of tools in our lives with art that magically transforms utilitarian objects into fanciful works that speak of beauty, insight, and wit. The museum’s signature fall exhibition, ReTooled profiles 28 visionary artists from the Hechinger Collection and includes major artists such as Arman, Richard Estes, Howard Finster, Red Grooms, Jacob Lawrence, Fernand Léger and H.C. Westermann; photographers Berenice Abbott and Walker Evans; as well as pop artists Jim Dine, Claes Oldenburg, and James Rosenquist. Some of these artists portray tools with reverence to emphasize their purity of design, while others disfigure and transform implements to highlight their obsolescence in today’s world of glass, steel, and technology. These works were brought together in the 1980s by John Hechinger, owner of a hardware store chain in the Mid-Atlantic region. Hechinger is often credited as one of the major figures in the transformation of the neighborhood hardware store to the “do-it-yourself” home improvement business. His intent to beautify a new company headquarters led to the acquisition of a tool-inspired collection of diverse 20th-century art. Hechinger later donated his collection to International Arts & Artists, a non-profit arts service organization based in Washington, DC, dedicated to increasing cross-cultural understanding and exposure to the arts internationally through exhibitions, programs and services to artists, art institutions and the public. Curated by Jared Packard-Winkler, ReTooled presents the works in four sections: Objects of Beauty, Material Illusions, Instruments of Satire, and Tools: An Extension of Self. In Objects of Beauty, artists celebrate the simplicity and purity of distilled design, emphasizing the beauty of soft curves, harsh cut lines, and the dull shine of hardy iron. Walker Evans’ photograph of a mundane tool in Wrench (1965) encourages viewers to find beauty in the wrench’s slim lines and economy of form, while Jim Dine’s series of nine works, Toolbox (1966), places screen print images of tools in ascetic, yet energetic compositions. These artists work to reveal the rare vulnerable beauty ofeveryday tools taken out of their work environments. Material Illusions presents tools through a distorted lens -- artists reimage tools and render them useless in unusual contexts to question their functionality. In Richard Adams’ sculpture Lathe (1979), he subverts the viewer’s initial view of a lathe by constructing the sculpture out of maple wood. homogenization. 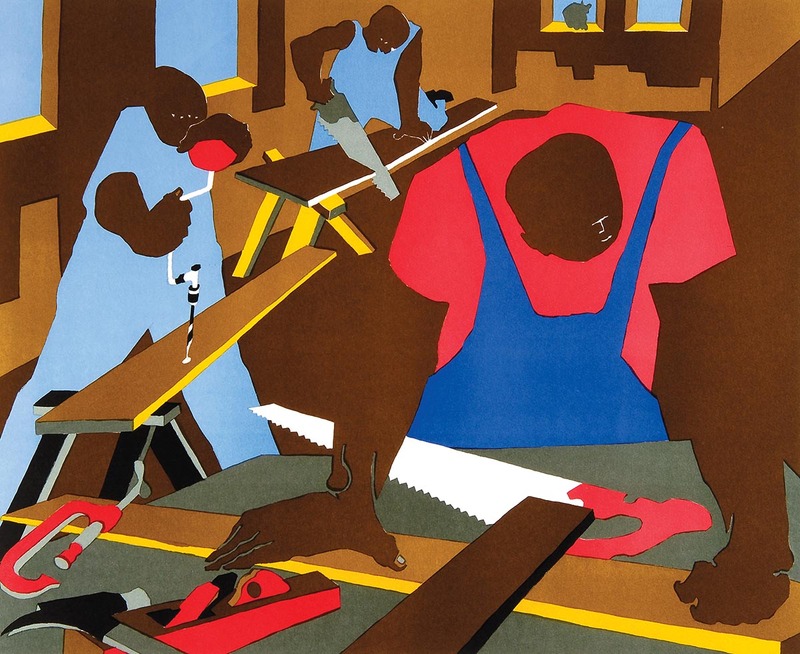 This collection highlights the distance growing between modern society and the simple tools that used to be synonymous with American progress, now replaced by the computer and other technological tools. In Instruments of Satire, artists play with tools by injecting sharp humor and wit into their works. In James Rosenquist’s Trash Can in the Grass-Calix Krater (1978), he presents a simple trash can adorned with ancient Greek imagery to elevate it to a vessel from antiquity. 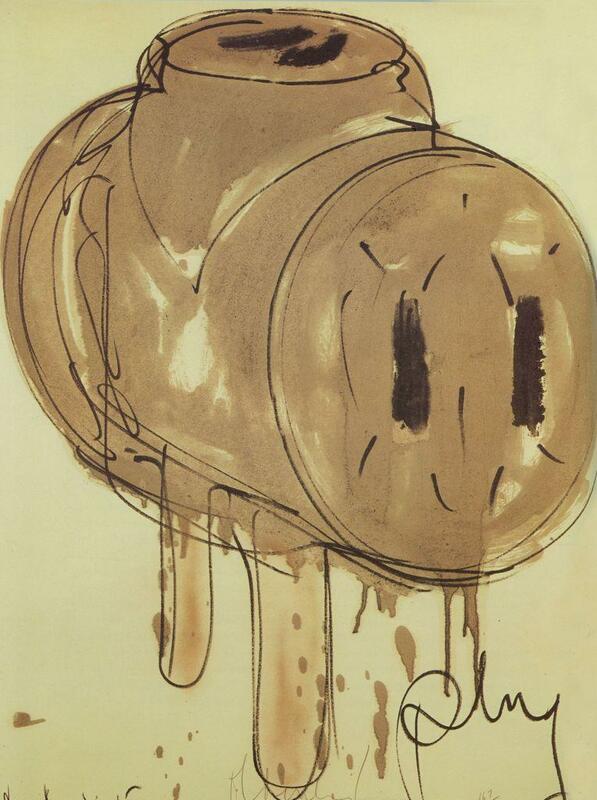 Claes Oldenburg, Three Way Plug, 1965, offset lithograph with airbrush. 39 x 31½ x 1 inches. Claes Oldenburg drastically heroizes an everyday object in Three-way Plug (1965) by rendering the plug with a larger-than-life status that verges on the comical. These representations of tools remind viewers that the essence of art is the joy of creation. In Tools: An Extension of Self, artists illustrate how tools have shaped the American consciousness by acting as our surrogate limbs and executing the actions that our vulnerable bodies cannot. Thus, the American core value of self-improvement is intertwined with these tools that create our capacity to create change and realize far-fetched visions. Howard Finster’s Saw/Mountains of People Use Tools (1990) pushes forth the idea that tools advanced human civilization by scrawling “tools came first and America was built second” on a Stanley Thrift saw. In The Slob (1965), H.C. Westermann imbues a hammer with the personality of its wielder, emphasizing the idea of the tool as an extension of human action. ReTooled: Highlights from the Hechinger Collection was organized by International Arts and Artists, Washington, DC. Gift of John and June Hechinger.